We are located at 3175 Bowers Ave, Santa Clara, near the Great America Parkway / Bowers exit off Hwy 101. * Intelligent Video Analytics (IVA). This event will showcase the most vital work in the computing industry today,including deep learning and AI, big data analytics, virtual reality, self-driving cars and much more. 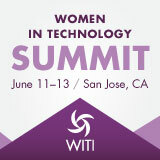 Held at the San Jose Convention Center from May 8 to May 11th. Speaker: Barry Hoberman, CEO and Chairman of the Board, Spin Transfer Technologies, Inc.
where one can build confidence, leadership and entrepreneurial skills, and the value of gender parity in the workplace. This conference is for both women and men.